This is the masterpiece by World Chess Champion Jose Raul Capablanca who is regarded as the strongest chess player who ever lived, prior to the arrival of Bobby Fischer. 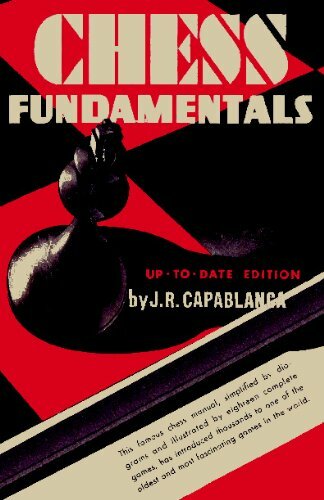 Chess Fundamentals, though normally for the beginning player, contains valuable insights that will benefit players at all levels of understanding, including masters. Strategy in chess is the overall art of forming a plan. This book assumes that the reader understands the rules of chess. While it is up to the reader whether he should continue, this book lays the foundation for all great chessplayers. Chess does not involve chance, the outcome completely depends on the players. The book covers the basics of chess, playing and notating the game, tactics, strategy, basic openings, examples of chess games, the endgame, variants and tournaments. The opening of a game of chess is a battle between two equally matched armies. There is no method that will secure one player a decisive advantage independent from what his opponent does. If there were, no one would play chess.